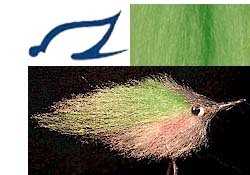 Fish‐Skull® Faux Bucktail is a tapered synthetic fiber designed to imitate typical premium‐length natural bucktail. 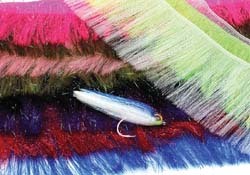 It has the same basic diameter, taper, gentle krinkle as natural bucktail. 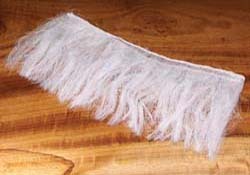 The ultimate synthetic substitute for marabou. 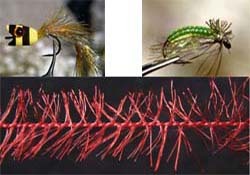 You will be able to tie dozens of flies out of one pack of Pseudo Marabou. It will keep its shape when fished and ties in very easy. A natural taper is achieved by pulling the fibers apart instead of cutting with scissors. 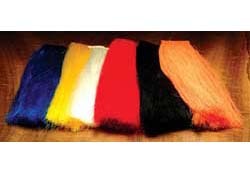 Can be used for tails, wings, bodies, collars, and veils. Pseudo Hackle is ready to use out of the package. Trim one edge to shape, tie in, and wind away. 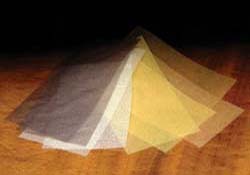 We have had this product manufactured out of bright trilobal fibers for a nice bright sheen. Instructions included in each package. 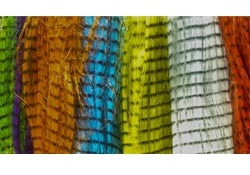 A beautiful mix of differently textured thin mylars with a specially treated edge for winding. 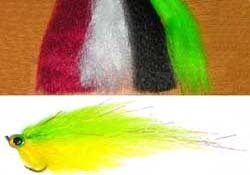 All you need to do to make baitfish and other patterns is wind Emulator Flash 2 or 3 turns, tie off, add some Eyes and Head Epoxy and you have a great fishing fly! 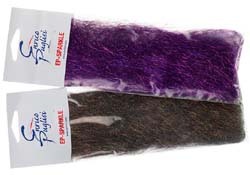 The fiber length on this material is 5.5" and is fused on one edge to make winding easy. 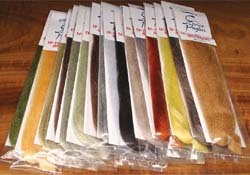 Perfect for longer streamers or any intruder style flies. 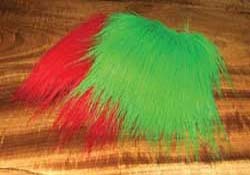 This one-sided synthetic hackle is easy to tie in and control. 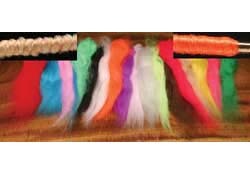 can be used as hackle, legs, and bodies. Swims like marabou when wet. 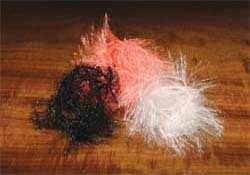 100 % Tri-Lobal hackle for synthetic dry’s, emergers and a nymphs. The longest and fullest craft fur you will see. 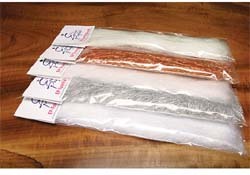 It's perfect for all your saltwater and streamer patterns. Extra long and extra full. 5" x 5". Once you wrap this brush in a hook you will have the inner core of one color and the outer core in a different color; glue in any of your favorite eyes and you’re good to go. 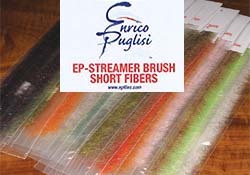 EP Enrico Puglisi Ultra Brush 5"
I see more and more people using this brush to tie steelhead flies however, I created this brush for the purpose of tying a streamer pattern using just one brush. Yes, you are reading right, with this brush you can tie one fly without needing any other materials. 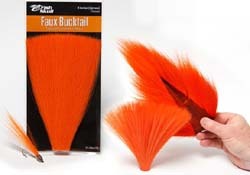 If you are in the rush to go fishing and have very little time at the tying bench this brush definitely will open the door to a new dimension. Returned after many requests. 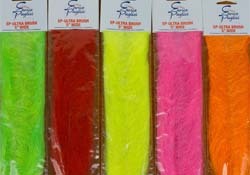 Has endless uses for both saltwater and freshwater tying - large streamers, bucktail lures, and lots more. 70 denier. Select bundles hand brushed. Cascade GRIZZLY HAIR is approximately 16" in length, with barring at every 3/16". 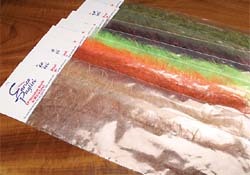 This synthetic hair is a no brainer to top any streamer fly, or to add a lateral line to any bait fish pattern. Ideal for large flies and streamers. It has a light crinkle consistency and comes hanked @ one end. We have even used it for posts on dry flies! Many uses including marrying it with flash materials like Dave Skok's Mushy Material. Keeps the fly light with a massive profile. 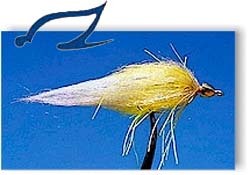 The ultimate hair for tying the "sculptured" flies that are the rage these days. Great for Salt and Freshwater. Congo vs Gator - Congo is softer & more voluminous giving it more movement in the water. I searched all over the country trying to find the best possible hair to use in a Dubbing Machine and finally found it right here in the Everglades. 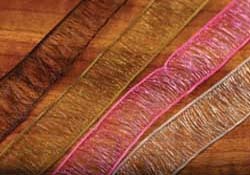 Most materials were either too stiff, too flexible, too fragile or too hard to use, but 'Gator Hair has the perfect blend of properties. Gator vs Congo - Gator is stiffer, but still soft enough to swim well. If you like to tie crabs, shrimps and anything else that crawl at the bottom of salt or fresh water this new brush will do the job for you. 6 Brushes per pack. 10” long. 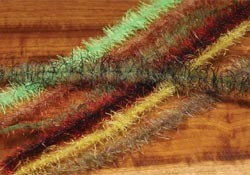 1/2” wide wire core brush ideal for crabs, smaller flies or minnow bodies. The addition of micro rubber legs to these 6, 10” brushes will give you incredible action. 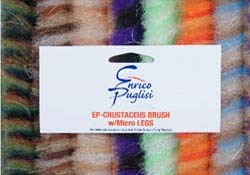 EP Enrico Puglisi Tarantula Hairy Leg Brush 1/2"
Two fiber length let’s you tie on and fish. The base material is Enrico’s EP Fiber with longer leg material mixed in. 3" wide; 6 brushes per pack. 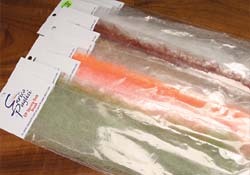 Today the EP™ SHRIMP DUB BRUSH is widely used not only to create shrimp patterns but also for many other fly patterns. 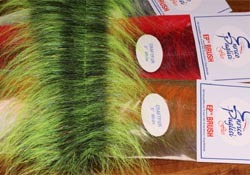 Used in ALL Enrico's fly streamer patterns to add the right amount of reflection. Thin to the point of translucency. With a nice sheen.